You know what's cool about March? Daylight is getting longer and longer which gives us an excuse to craft EVEN longer, right? Grab this versatile sketch and make a bunch of great cards for any theme. Below you'll find Sketch 273. Create cards, scrapbook layouts, home decor, treat containers, mixed media, etc. using this week's sketch and be sure to link your project below for a chance at the weekly My Favorite Things Gift Voucher worth up to $20. The My Favorite Things Creative Team has been busy getting creative! Let's see what they have up their sleeves for Sketch 273! Julia gathered together a lot of lovely layers with Sketch 273. Those multiple panels allow for lots of depth and pretty detail. Her use of the Dots & Stripes Sorbet paper pack gives her design quick interest, and the delightful flower she created with the Prima Donna Petals Die-namics adds fresh spring appeal. 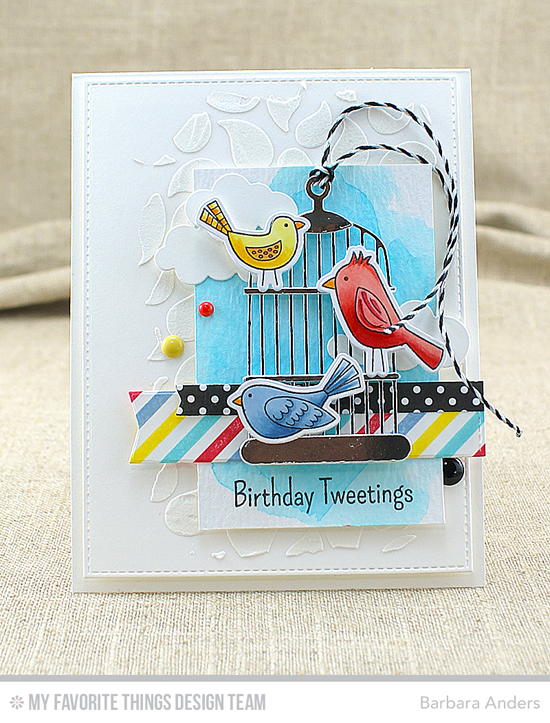 Yoonsun's delightful design displays a pretty feathered friend from the Tweet Friend stamp set and Die-namics. The two horizontal flags from the sketch anchor the cage from the Cheerful Cages Die-namics and give the sentiment a place to rest. 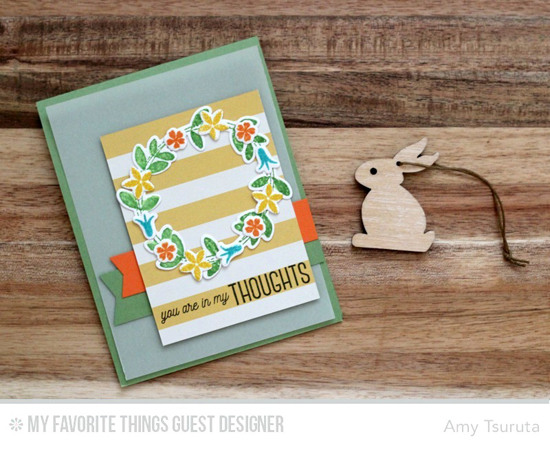 Welcome again to Amy Tsuruta, our Guest Designer this month! Let's see how Amy interpreted this week's sketch. Take a look at something interesting that Amy did with the sketch. The main focus is the Spring Wreath stamp set and Die-namics, but in order to stick with the sketch, Amy didn't want to remove the horizontal flags. 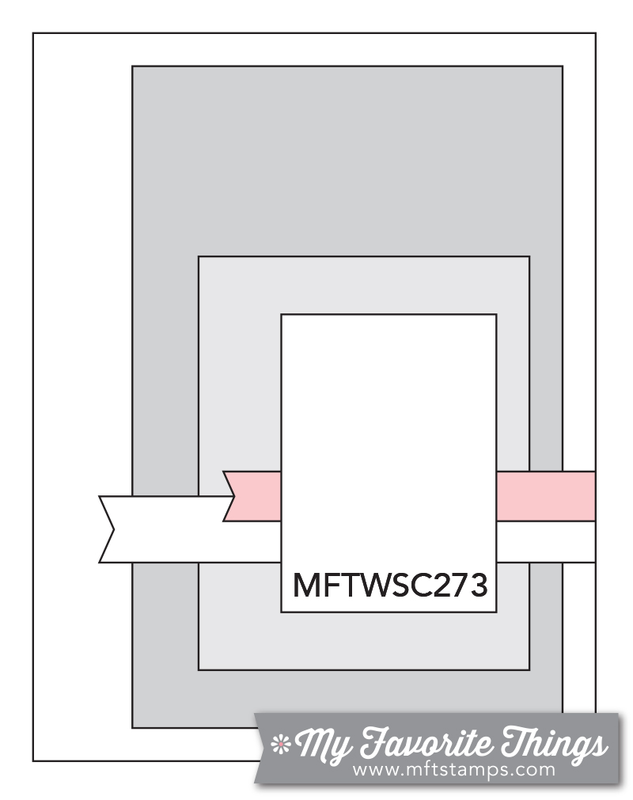 In order to not obscure the pretty wreath, she placed the flags underneath the rectangle panel. What a great solution! 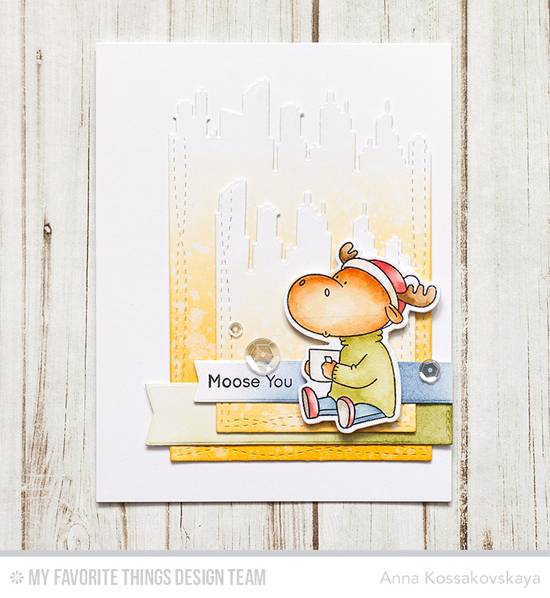 Anna's rectangle panels from the sketch are made more interesting with the tops cut with the New York Skyline Die-namics. By eliminating the Statue of Liberty and the Empire State Building, she is able to make this look like any metropolitan skyline. I love the way that she interspersed her flags between the panels for depth and interest. The focus is on a peachy color combination in Inge's adorable design. 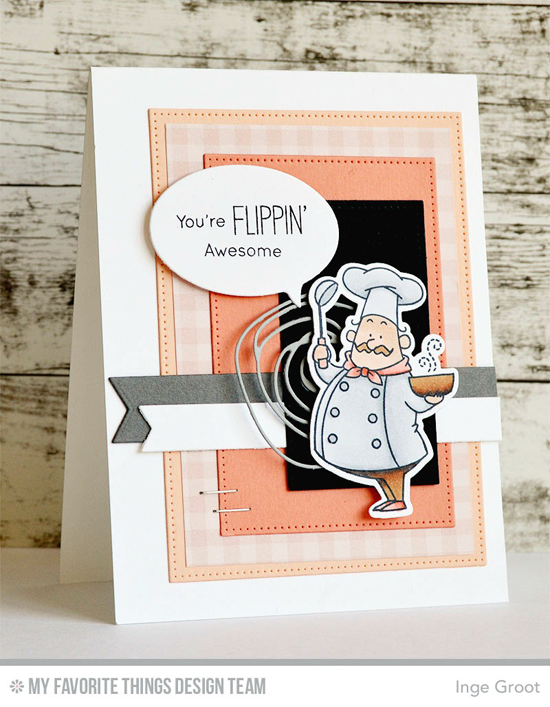 Just like in the sketch, there are fun panels and grounding flags as a place to showcase Chef Francois from the Recipe for Happiness stamp set and Die-namics. I wonder if he's whipping up some peach cobbler? 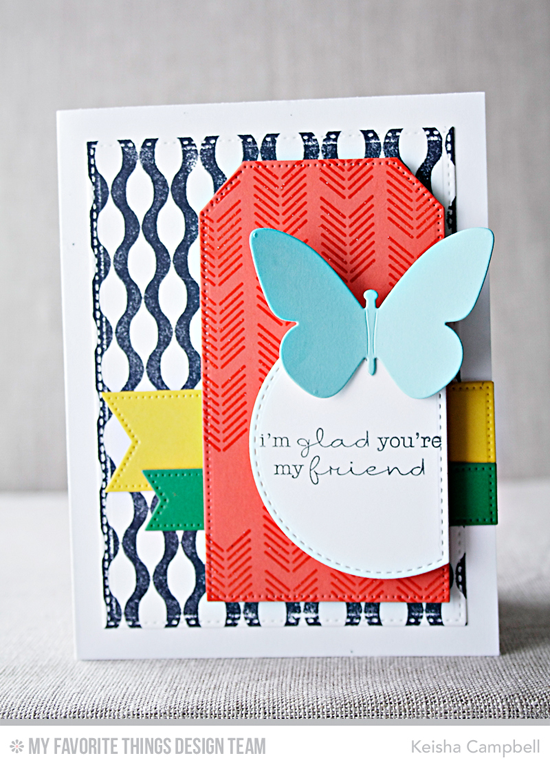 Barbara's card is a tactile dream with lots of terrific texture. Instead of an actual rectangle in the background, she creates the illusion of a rectangle with the tone on tone use of the Bold Paisley stencil. 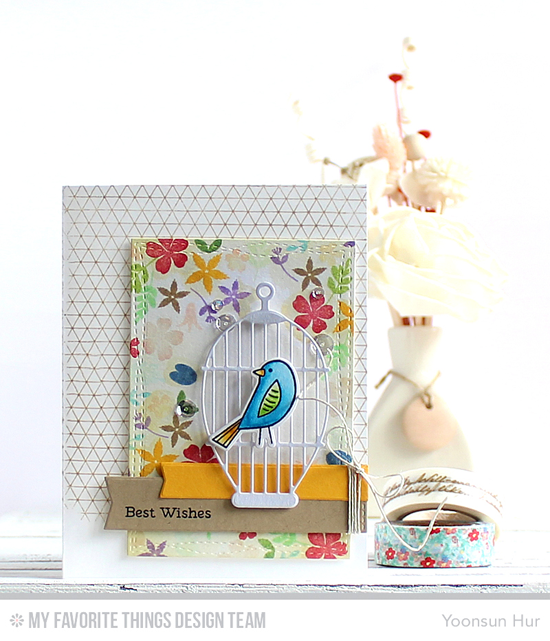 Colorful patterned flags and a flock of feathered friends layered on top of the Cheerful Cages Die-namics add to the touchable nature of this card finished off with a bit of baker's twine. Bold colors and striking patterns make up Keisha's eye-catching design. Her expert use of the Arrow Ends Background Builder and Winter Waves Background stamps give this card a chic and modern look. The simple butterfly and lovely sentiment shine against the colors and patterns. Congratulations, Vanilljas! You are the randomly selected winner of last week’s sketch challenge. You can view all the entries for last week’s challenge HERE. You have until Tuesday, March 29th, at noon EDT to add your link and be eligible for the prize of up to $20 in MFT Cash to be spent in the MFT boutique. Winners are chosen at random, so everyone has a chance! The weekly prize is a $15 Gift Voucher to My Favorite Things, but if you use MFT stamps and/or dies in your project, you’ll receive an extra $5. Another fun sketch this week! Fabulous DT inspiration as always.